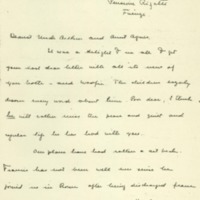 Jessie Wilson Sayre writes to her aunt and uncle about the family’s plans to return home due to her son’s ill health instead of biking through Germany. Her youngest son, Woodrow Wilson Sayre, is ready to return home. It was a delight to us all to get your last dear letter with all its news of you both—and Woofie. The children eagerly devour every word about him. Poor dear, I think he will rather miss the peace and quiet and regular life he has had with you. Our plans have had rather a set back. Francis has not been well ever since he joined us in Rome after being discharged from school as cured of mumps. He had a relapse when we reached Florence and just cannot seem to pull up as he should. The least bit of exertion and he has a temperature again. The doctor here, and he seems an excellent doctor and a very nice man, besides, doesn't want him to go back to school again this year. He advises the sea shore and life out doors in the sun. He absolutely vetoes, of course, Francis' plan of bicycling this summer in Germany—and the family vote is overwhelmingly in favor of home. So we will sail back in June or early in July for a summer in our own little cottage in Martha's Vineyard. I'm sure its best all round and though I'm not keen about starting housekeeping again yet, it will be worth it to be back in our familiar surroundings. Francis does not want to be considered “invalidy” and so we are not saying that his run down condition or illness is the reason of our coming home. I will simply say one of the children hasn't been very well and we are coming home in order to have a less strenuous summer, or simply, which is the truth as far as the children are concerned, that they are tired of Europe and want to come home. Europe has lost its charms for Woodrow! He has been begging to leave for months and the burden of his song is “Woofie” “I want to see Woofie.” Probably we will go straight to Martha's Vineyard from New York deposit the children there and then I'll run up to Boston for maids etc. while the children and Mr. Sayre eat at the hotel. Or we may accept Mrs. Forbes' invitation for a week at and both Frank and I go up to Boston. Hew He has several things he wants to see about at once up there and we both want to see you two dear dear people as soon as possible. Sayre, Jessie Woodrow Wilson, 1887-1933, “Jessie Woodrow Wilson Sayre to Agnes Vaughn Tedcastle,” 1931 May 2, WWP17546, Jessie Wilson Sayre Correspondence, Woodrow Wilson Presidential Library & Museum, Staunton, Virginia.